One of the most difficult aspects of dealing with mesothelioma treatment is the side effects that patients may experience from chemotherapy or radiation. Unfortunately, sometimes they cause individuals to lose their motivation to stick with their regimen. At Mesothelioma Circle, we want to offer as much support as we can in order to make sure that does not happen. It may help if you knew what side effects to anticipate before they manifest. For any individual about to undergo cancer treatment, hair loss, also known as alopecia, is a major concern. Not only may the change be alarming, but it can upset any sense of normalcy. Understanding the causes of alopecia and what adjustments you can make may make the experience easier for you and your loved ones. Chemotherapy is one of the most powerful weapons against mesothelioma. These medications can stop the diseased cells from dividing and control tumor growth. Clinicians often administer these drugs as injections. The problem with having these medications circulate everywhere around the body is that they not only attack the cancer cells, but they also strike healthy cells located all throughout the body. That includes the hair follicles. Hair loss is more likely with certain drugs than it is with others. When it comes to mesothelioma patients, alopecia is not closely linked to pemetrexed, but it is a potential side effect of cisplatin. If alopecia does occur, it usually starts two to three weeks after chemotherapy begins. 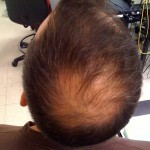 The rate of hair loss may increase after one or two months. However, experts from the American Society of Clinical Oncology say that not all patients experience alopecia the same way, even among those who take the same medication for the same disease. Hair loss may occur all at once, gradually or in sections. It can affect the head, underarms, limbs and private parts. Alopecia may also occur because of radiation, but this is usually confined to the region that receives treatment. Alopecia affects more than just one’s physical appearance. It can also hurt one’s sense of self-esteem. We want all our patients and their loved ones to remember something: hair loss is not something to be ashamed of. If anything, it is a sign that you are bravely fighting a mighty battle. However, that is not to say that hair loss is necessarily a trivial matter, either. It is perfectly normal and understandable to get upset if you do experience alopecia. But we also want to make sure this process is as easy for you as possible. Cancer experts say that it may be best to discuss alopecia before therapy begins. Conversations with both doctors and loved ones ensure that everyone knows what to expect, potentially lessening any shock. If you are thinking of getting a wig or hairpiece, try consulting a retailer or designer before beginning treatment. The size of the product can be adjusted as more of your own hair falls out. If you get your doctor to write a prescription, your wig or hairpiece may be covered by insurance. Your physician may even be able to give you a referral to a reputable business. Be gentle when washing or brushing your own hair. Protect your scalp from ultraviolet radiation with sunblock or a hat. Wear a scarf or hat to protect your head from additional heat loss in cold weather. If you find that you need additional emotional support through this process, seeing a counselor is a great idea.